A Vietnamese Coast Guard officer takes pictures of a China Coast Guard vessel near China’s oil drilling rig in disputed waters in the South China Sea on May 14, 2014. New report reveals China can use its coast guard to surreptitiously expand its coastline. China’s newly militarized coast guard gives the nation a dangerous new weapon and increases the chance of war in the South China Sea. This was the conclusion of the U.S.-China Economic and Security Review Commission’s annual report to Congress, published last month. The move also established a clear military chain of command from President Xi [Jinping] and the cmc down to China Coast Guard and People’s Armed Police frontline forces. 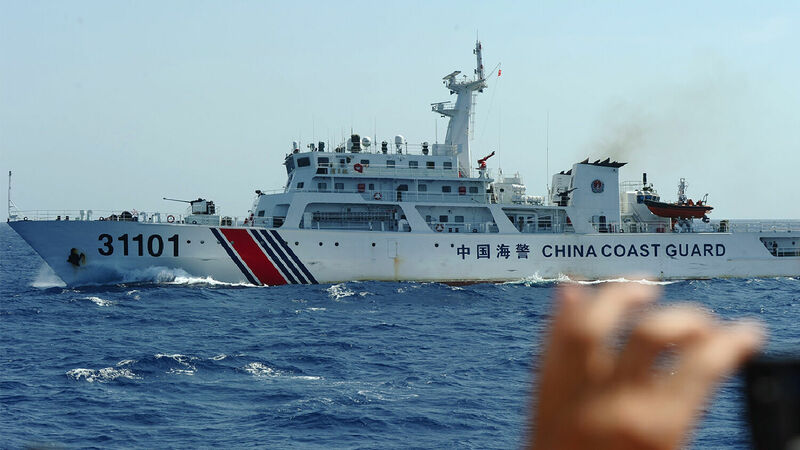 … The primary reason for bringing the China Coast Guard under the People’s Armed Police was likely to enhance the China Coast Guard’s role in advancing China’s maritime territorial claims. Having direct command of the China Coast Guard will enable Chinese military leaders to finely calibrate the force’s role in “gray zone” operations to advance maritime territorial claims while keeping activities below the threshold at which other countries would respond. In other words, bringing the China Coast Guard under the cmc command structure (via the People’s Armed Police) makes the sea force a more effective tool for Chinese coercion campaigns under the guise of “maritime law enforcement” or “maritime rights protection,” but also suggests the China Coast Guard could be viewed by Japan and other claimants in the East and South China seas as a military force rather than civilian law enforcement, due to its unambiguous military command. China, however, maintains that the People’s Armed Police and China Coast Guard still retain law enforcement responsibilities, creating a situation that increases the chance for miscalculation. Essentially, the China Coast Guard has become a branch of the Chinese military, with a chain of command directly to Chinese President Xi himself. The China Coast Guard was first established in 2013 under civilian control to “maintain good order at sea, save lives, and protect the environment.” The majority of national coast guards around the world are under civilian control, but other nations, including France and the United States, have coast guards that operate as branches of their militaries. One of the biggest concerns that this militarization raises is how other nations should respond to the China Coast Guard in its new role. When it deploys near disputed waters, it could merely be performing a routine maritime protection operation, or it could be acting aggressively as a military force. This is of particular concern to surrounding nations involved in territorial disputes with China. Japan would have once responded to incursions by the China Coast Guard with its own coast guard, but, as a Japanese government source states, “[T]he boundary between police and military activity has grown unclear, making it difficult to respond.” How does a country respond to China Coast Guard ships when it doesn’t know if they are working under military deployment or on a routine maritime patrol? At the same time, China is expanding the size and military capabilities of its coast guard. Some of its newest ships contain helicopter pads, larger guns, water cannons and reinforced hulls. This rapid militarization of China’s coast guard aligns with Bible prophecy. China will continue to rise to become a formidable military power. In this end time, a massive power bloc of Asian nations will arise, led by Russia and China. In Revelation 16:12, God calls this superpower “the kings of the east.” Revelation 9:16 shows that these kings will build a 200 million-man army! An army this massive, comprised of several Asian nations, has to include China, whose immense population makes an army of this size completely plausible. This power will clash with “the king of the north,” as described in Daniel 11:40-44, but before this occurs, China will work to bring down America. Deuteronomy 28:52 warns that the end-time nations of Israel will be besieged “in all thy gates.” These “gates” refer to the strategic choke points in maritime trade. Whoever has control of these maritime gates has control over world trade and great power that can be used against other nations. God gave the modern descendants of ancient Israel, including Britain and the United States, control of crucial sea-gates. But now He is taking away that power and giving it to their enemies to use against them, “until thy high and fenced walls come down, wherein thou trustedst, throughout all thy land: and he shall besiege thee in all thy gates throughout all thy land, which the Lord thy God hath given thee” (verse 52). China’s militarization of its coast guard and the South China Sea is fulfilling this prophecy. We follow this trend because of what will happen after the siege. All of these major events prophesied in the Bible are part of a series of events that lead right up to the return of Jesus Christ. To understand more about where events in China are leading, please read “China Is Steering the World Toward War” and request our free booklet Russia and China in Prophecy. It is vital that we understand these prophecies as we expectantly watch for the return of Jesus Christ.